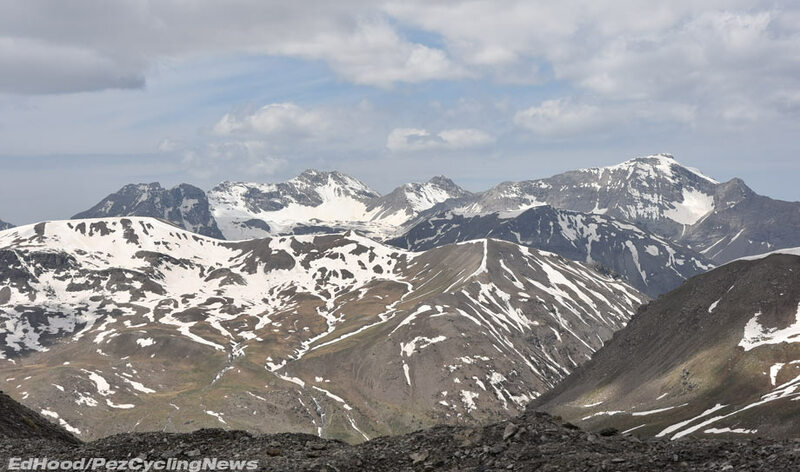 GIRO'16 Roadside St.20: PEZ was on the roads over the Col de la Bonette and the colle dell'Lomarda as Vincenzo Nibali turned this Giro around on the storming final day in the Alps. 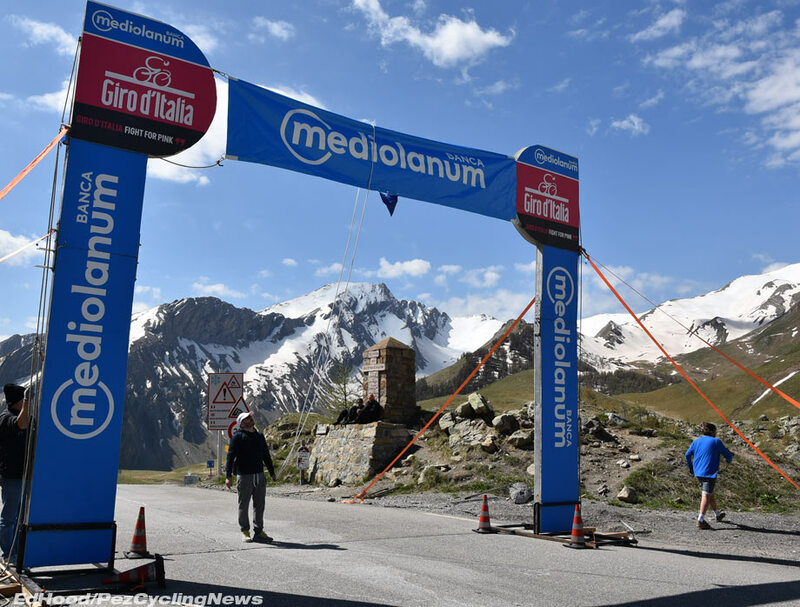 It's time to go roadside at the Giro! 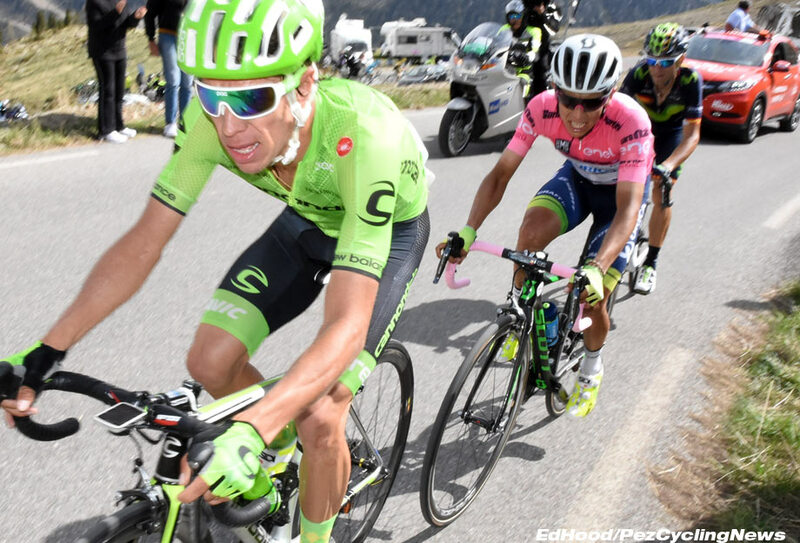 -- We may have missed the crucial Stage 19 crash yesterday but the move which won the 2016 Giro D'Italia happened right in front of us on Stage 20 atop the fearsome Colle delle Lombarda. And we have the pictures to prove it - read on! It's a glorious day in The Alps, our digs were quiet and clean, way out in the country, we slept like babies, we're up early and on the road. It's not a day to waste - yesterday's drama set the scene for what would be a huge final day in the mountains. Nibali has risen - a little like Count Dracula used to do - from the dead and is now only 44 seconds behind nuovo maglia rosa, Chaves. The Italian will do everything in his power to usurp the little Colombian, today - that's for sure. Kruijswijk, meanwhile languishes @ 1:05. Can he come back from that horror crash? Unlikely but in this Giro we have to expect the unexpected. Valverde is fourth, just 43 seconds back on the Dutchman, he'll want that podium place. Guillestre, the tappa start and IMMEDIATELY into the Col de Var, a savage 18.2 kilometres at an average 6.0% with a maximum of 13%. As Dave says, 'they'll need a good warm up on the turbos today!' The stage will barely have started and the gruppetto will form. The views get ever more spectacular the higher we climb. 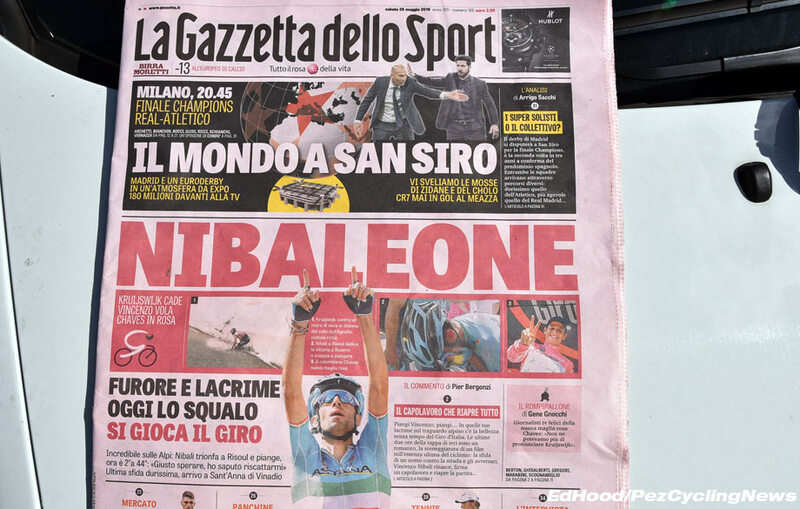 I take the opportunity to check out the Gazzetta; as you might expect, it's all about Vincenzo - we even get a play on words; 'Nibaleone.' But perhaps the Emperor Napoleon would have shown a little more compassion for a fallen adversary? And on that note, Kruijswijk's demise gets short shrift in the pink pages. It's rather; "well, that's the Dutchman gone - his fault for falling off" kind of a vibe. 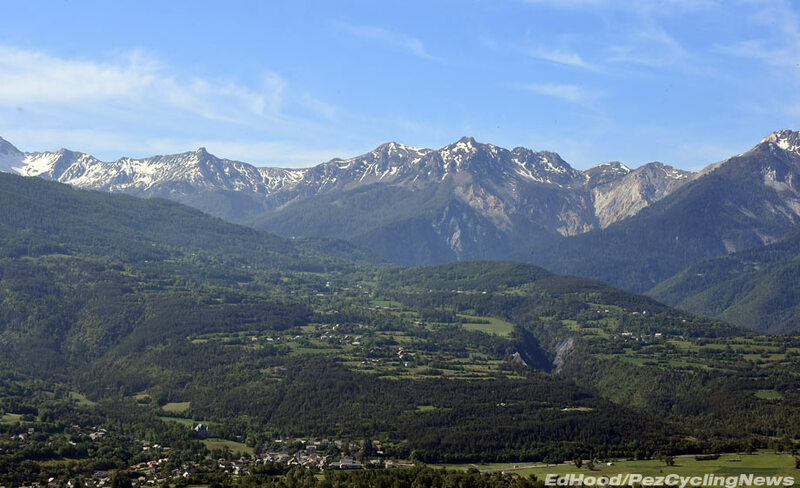 The summit of the Vars provides us with spectacular views. It's doubtful though that any of the 157 survivors will have any interest in the snowy vistas. As well as Zakarin going out in a bad crash the race lost Betancur, too. We saw him on the Agnello and he looked done. And at this altitude because you're so close to the heavens, it's no surprise to find a lovely - if a wee bit run down - chapel. The descent is a typical Alpine drop, long straights, sweeping curves and some hairpins. The surface is good though and there are no trees to produce those dangerous dappled light conditions. There's little time on the valley floor before we hang left on to the Col De La Bonette, a massive 22.2 K with an average grade of 6.7%, a maximum 10% and topping 2,700 metres. Straight it is not, winding it's way up the mountain side by tight bend after tight bend. Up, up, up until with two K to go we could be in the Himalayas, the snow banks are huge - the snow clearers have worked hard up here. We've beaten the summit banner crews to the top but we pull in to grab some images - the air is sharp, thin, cold, we don't linger. The descent begins immediately; technical, dangerous, scary, other worldly. 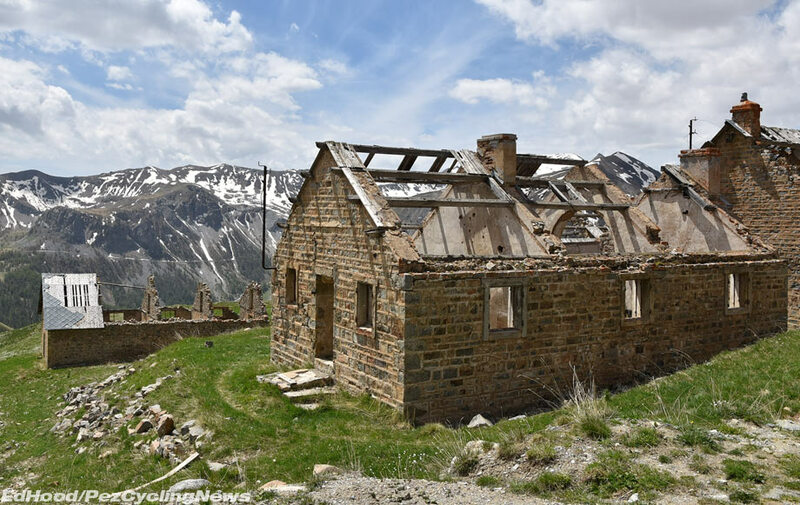 So is Camp Des Fourches an abandoned French army military 'village' on the descent of the Bonette - it would take a few Euros to get me to spent the night there. 'Ed!' I hear the shout, huh ? It's Ale Federico my PEZ-Italia colleague, long time no see. Ale's take on the Kruijswijk incident is that the Dutchman lost it due to the pressure Chaves had been placing him under on the Agnello. The descent is long, not particularly well surfaced and technical. 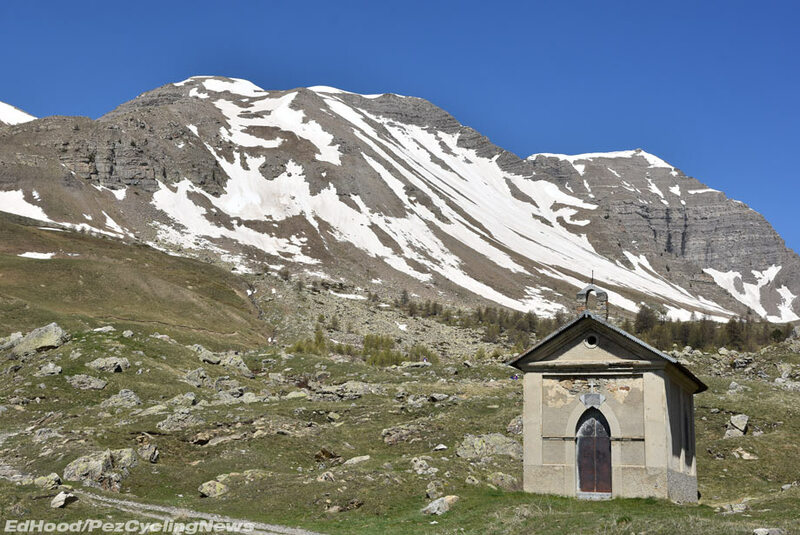 The drop bottoms out at Isola and immediately turns left up the road to the Isola 2000 ski resort and the Colle Della Lombarda, 19.8 K @ average 7.5% maximum 12%. It's a 'no messing' climb, steep from the start with multiple hairpins. The lower slopes are strangely quiet, very few folks parked up and not nearly as many bikers as on the Agnello, yesterday. No vistas have opened up, rather the road tracks a river up the cleft it's carved in the hill and wooded valley wall rears on both sides. The woods thin and there are scree slopes both sides as the road takes to tunnels to protect it from rock falls. 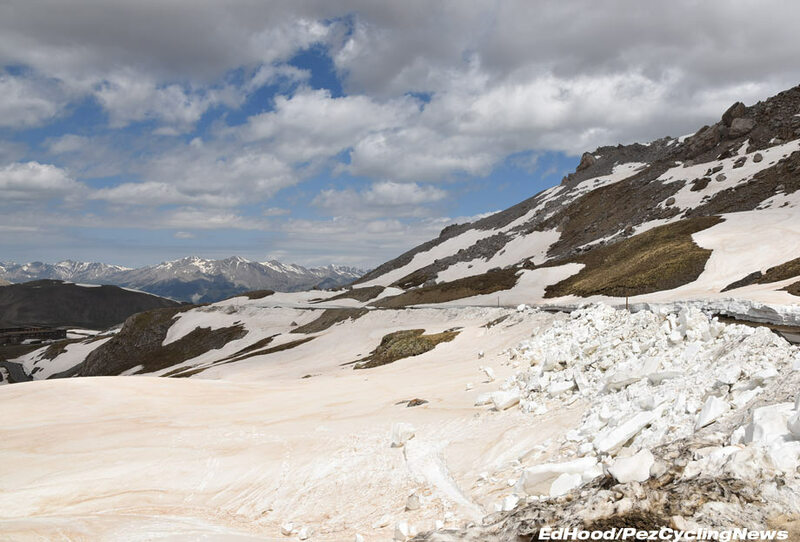 The plan was to find a bar in Isola 2000 high on the Lombarda and watch the approach to the col on the TV in a bar before dashing out to watch it pass then catch the finale on TV. But as Robbie Burns said; 'the best laid plans of mice and men gan aft aglae' - I'd forgotten that there's nothing deader than a winter ski town come the spring so here we are, just inside the kilometre to the summit banner amid spectacular scenery. Settle down and wait. It's much busier up here, mainly Italians - the border is at the summit. 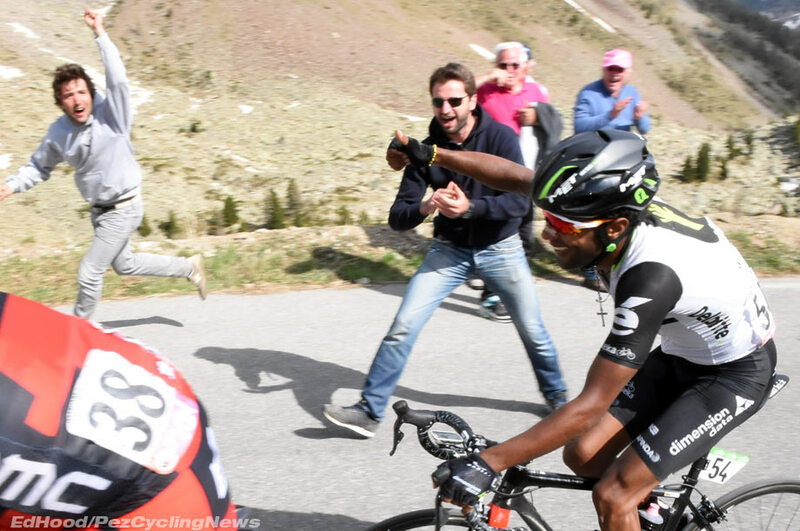 The French don't really seem to have embraced this Giro - but we're loving it. 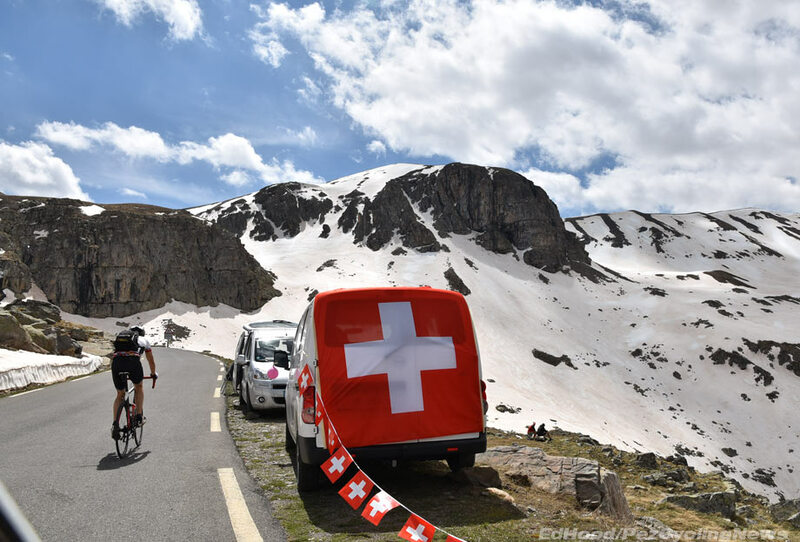 The latest info we have is that there's a diminished group well clear: Joe Dombrowski (Cannondale & USA), Rein Taaramae (Katusha & Estonia), Darwin Atapuma (BMC & Colombia), Giovanni Visconti (Movistar & Italy) and Mikel Nieve (Sky & Spain). The last named having hoovered up enough points along the way today to leapfrog Cunego in the King of the Mountains contest. Police bikes - a lone rider, in red, it has to be the Estonian. He's a man on a mission for sure, fully race faced - he has less than a K to the top then a nasty 8 K descent before a final 2.3 K lift to the line. Atapuma next, 15/20 seconds ? 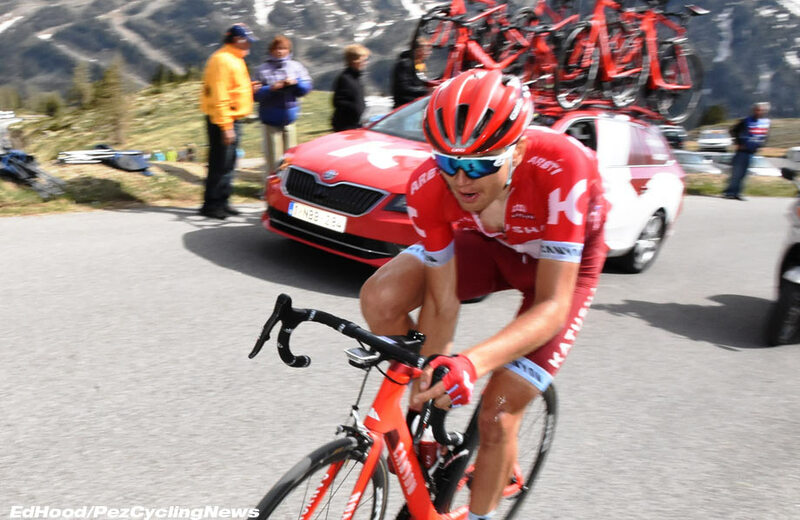 It's difficult to see the little Colombian catching Taaramae on the descent - we'd put the Katusha man down as winner on this day. 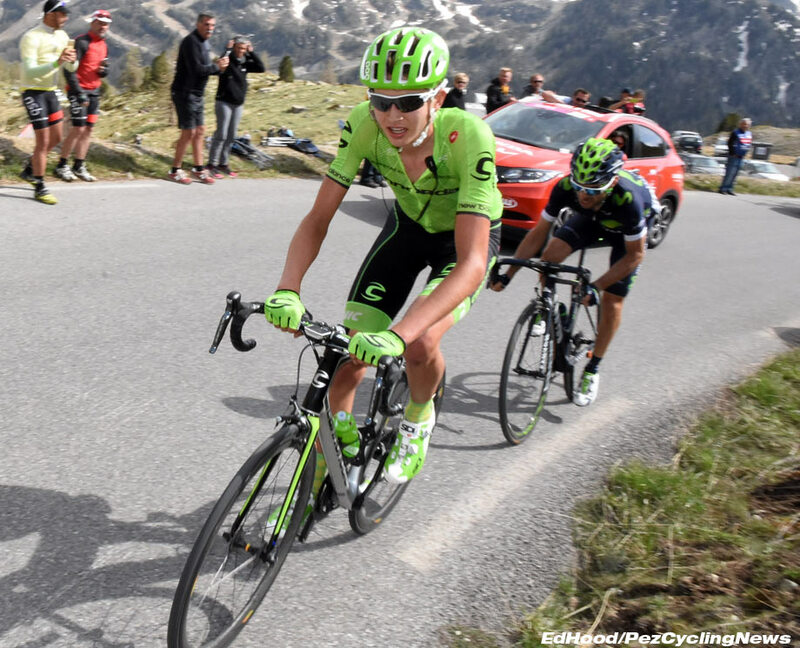 Dombrowski is next with Visconti on his wheel, much as we'd love to see it we can't envisage Joe getting up to Taaramae. Then it's Nieve, he looks tired but it's 'job done' to take the King of the mountains; he's single handedly saved Sky's Giro - a stage win as well as today's great ride to compensate for Landa and Viviani's exits. 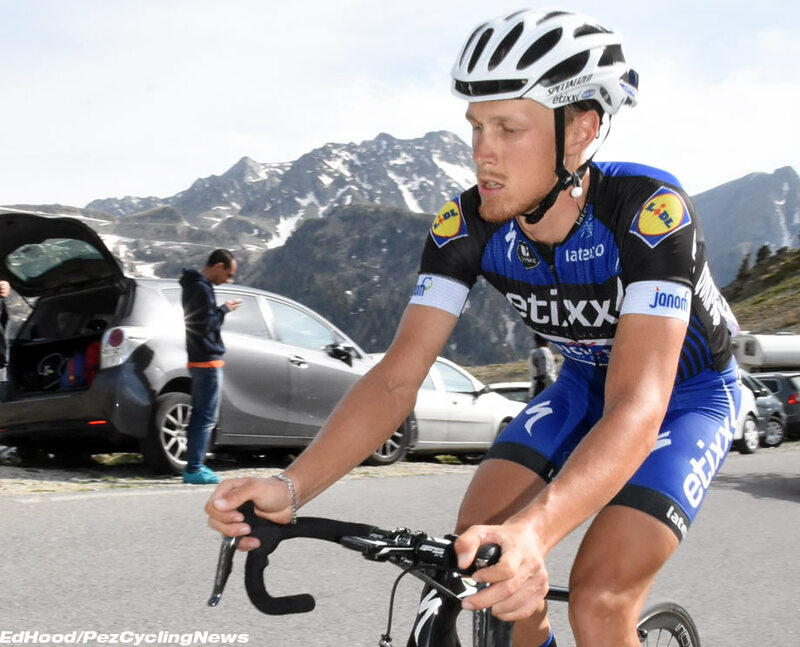 Stage winners Foliforov and Brambilla were shelled from the break and are simply riding to the finish. 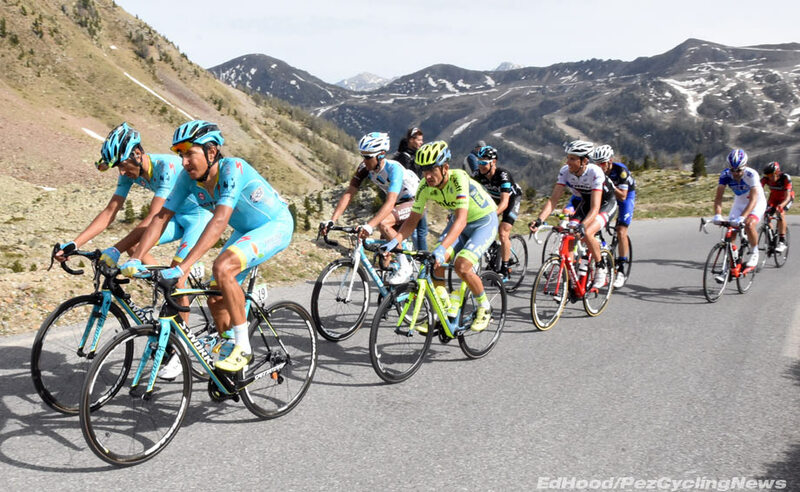 We hear the shouts in the distance, strain our eyes, two Astanas; that's Nibali on the right ! 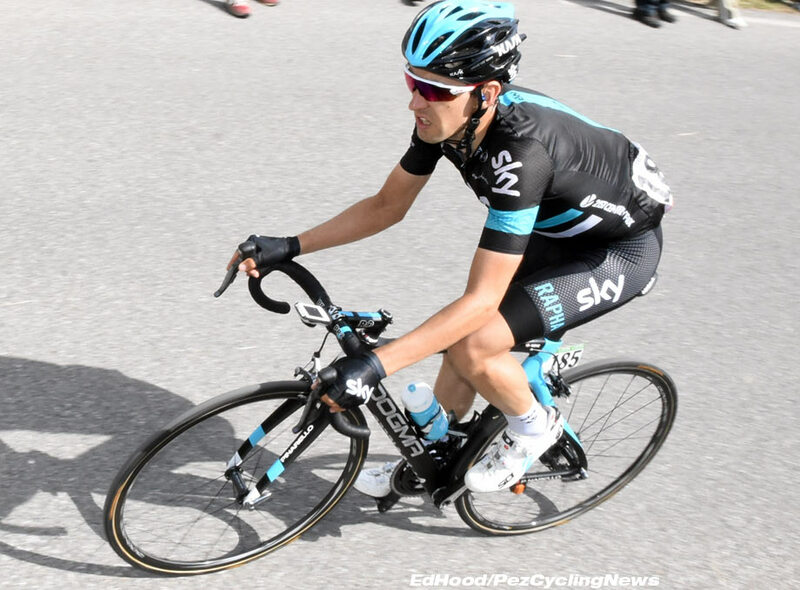 No, Kangert who's ridden himself into the ground to take his Capo clear of the maglia rosa, he sits up, wasted just yards below us; it's all down to Nibali now, he whistles past us - a man on a mission. He needs 44 seconds on Chaves - all the bonuses have gone so it has to be on 'real' time. There's the maglia rosa, he's on Uran's wheel and not looking comfortable - Valverde is last man in the trio, they're maybe 20/25 seconds down. 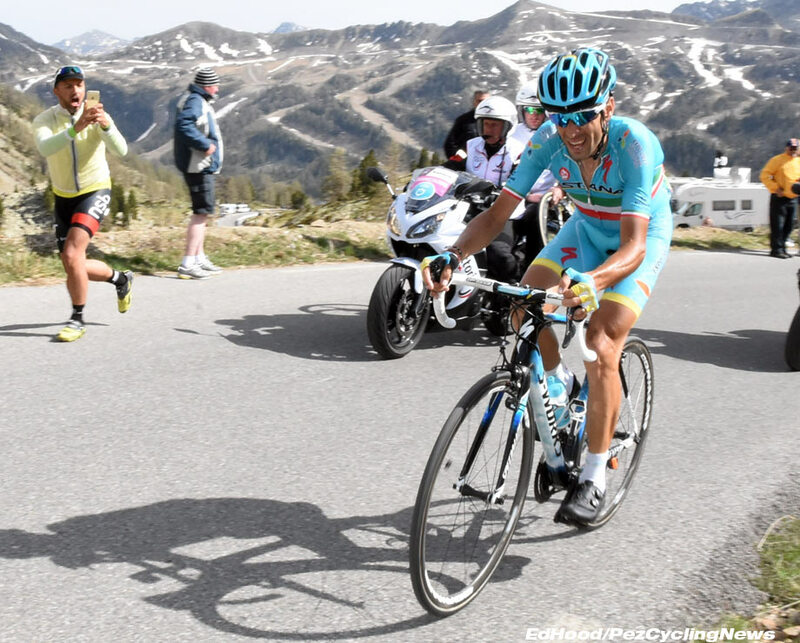 The descent is very tricky, if Nibali is 'on' he can win the Giro right here. 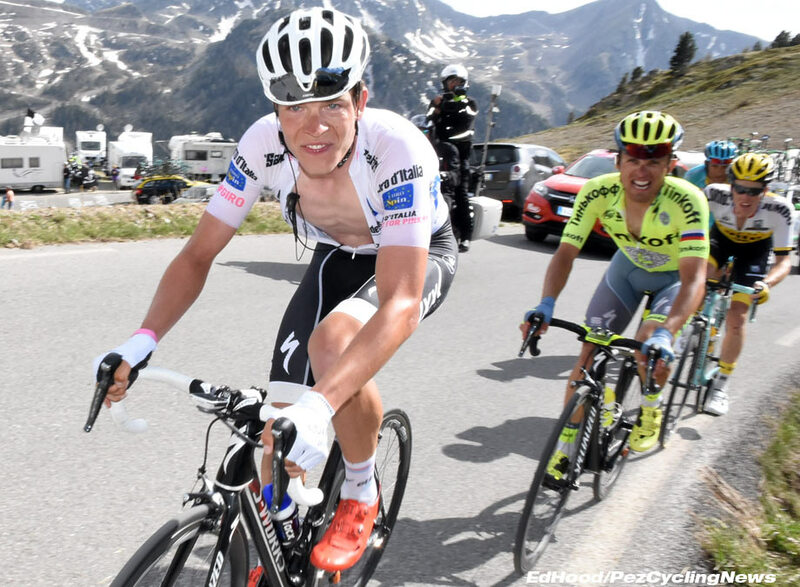 Jungels is next up, leading Majka and poor old Kruijswijk - it looks like the Dutchman is losing his podium place to Valverde. They come then in ones and twos, sixes - no big groups at all. The Kudus fan club is out - they go crazy for their Dimension Data African climber, he salutes them then slogs on towards the top. Cunego is in a little group of eight riders, his head slumped, that dream end to his career has evaporated. 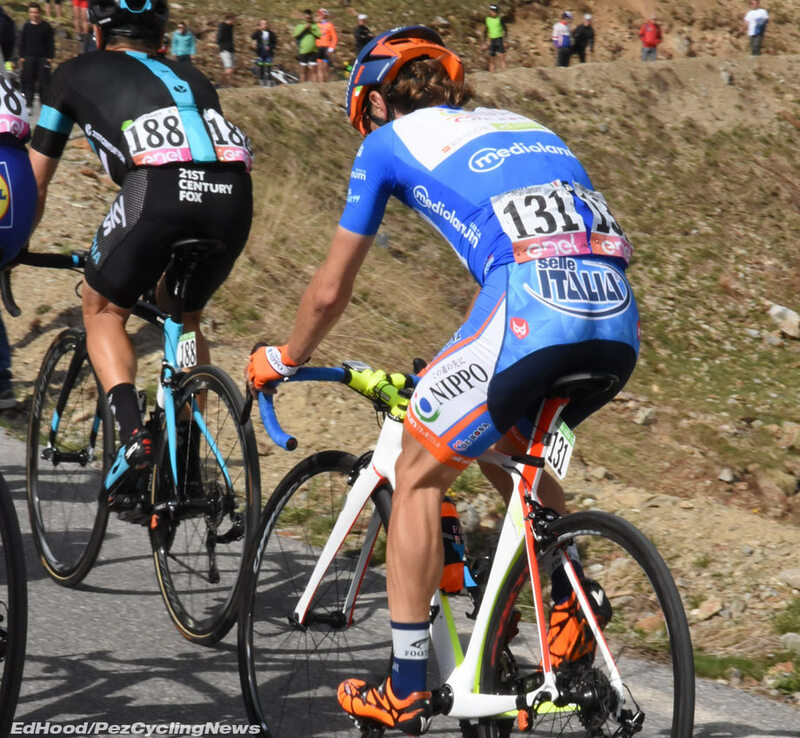 Eventually, it's gruppetto time, the time gap is huge - Pippo leads whilst asking a spectator for a bottle. QuickStep's stage winner of two days ago, Matteo Trentin - how the wheel turns. We peer in through a camper van window - Nibali is in tears on the tiny TV screen. He's done it - Jeez ! Chaves second, Valverde third and Taaramae took the stage. What a tappa, what a Giro ! 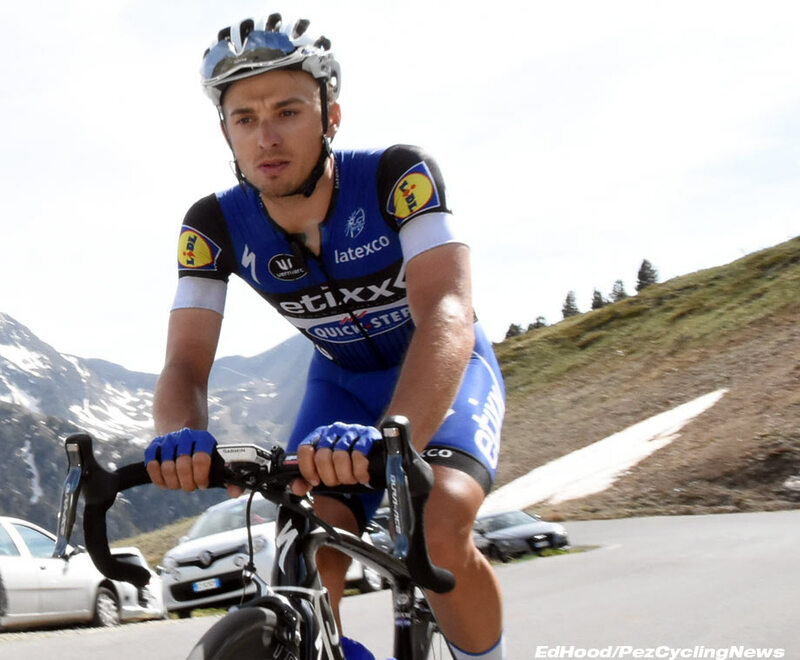 And it's not over yet - will it be a Modolo v. Nizzolo shoot out in Torino tomorrow - or will someone 'do a Keisse' and slip away to last stage glory ? Don't touch that dial !